A lovely place to stay. Brendan and Geraldine were very welcoming and extremely helpful with ideas and directions of where to visit. We were on motorbikes and they found us some roads which were challenging, to say the least. Breakfasts were great, with a wide choice. If there was one slight complaint, it was more like 15 minutes walk from the town centre rather than 5, however that helped with the digestion after the excellent meals we had in Kenmare. Our stay at Abbey Court was wonderful. Our host greeted us pleasantly, even though we arrived late, and it was his dinner time. He graciously showed us to our wonderful rooms, beautiful views and a pleasant night's stay! The next morning, we had a delicious Irish breakfast. We enjoyed our stay and highly recommend it! Beautiful house, location, view and hosts. Very helpful and great breakfast! We had a wonderful stay! Both Brendan and Ger helped up at different times during our stay with making plans and with directions. Brendan gave us a ride in to town our first night there and pointed out restaurants we could try. The rooms were wonderful, the upstairs sitting area so comfortable and the food was great. Thank You! We recently enjoyed a wonderful stay at Abbey Court. Our hosts Geraldine and Brendan were wonderful, they even gave us a lift into town as my husband cannot walk too far. The breakfasts were great and our room very clean and comfortable. We would recommend it to anyone and definitely stay there again. Loved this place. Great location just outside of the busy little town. Lots of charm to the location and the rooms were clean and satisfactory. Showers were tiny by our standards but that was fine. Good breakfast and the owner was very kind and helpful suggesting some activity locations for things we were trying to do. Would stay again. My husband and I and our 2 nieces had so much fun staying at the Abbey Court B&B! The setting is beautiful, the house is charming & clean, the people, friendly and warm! Branden put out lots of cookies & coffee or tea when we arrived. He also did our laundry! What a blessing! And the breakfasts were plentiful. It was early Sept with great weather and the walk to town Kenmare was 10 minutes where the restuarants were fun with the best food! We highly reccommend and would hope to go back to stay here. It was the best! We stayed one night in the Abbey Court, and found Brendan and his family to be warm, attentive, and helpful. The grounds were very clean, as was the lodging, and it was about a five to ten minute walk into Kenmare from the house. The view of the water behind the house was pleasant, and the breakfast was excellent. Brendan also had several travel tips that we used. I would highly recommend the services and amenities at Abbey Court. Our family had 3 rooms for our 5 night stay 7/24-7/28/13. Abbey Court is a lovely place; rooms were clean and comfortable. Breakfast was fresh and plentiful. 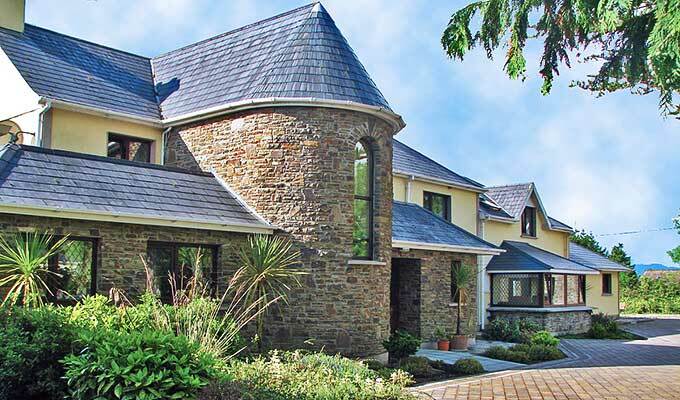 Location was less than a ten minute walk to the heart of Kenmare. The best thing about our stay was the owners of Abbey Court. Brendan and Ger couldn't have been nicer. They treated us like family, providing us with road maps, arranging for a private bus tour of the Ring of Kerry, loaning us books on Irish ancestry, and even doing a bit of laundry for us. If you want to feel like you are home in a beautiful spot overlooking Kenmare Bay, Abbey Court is the place to stay. Very nice B&B in a nice neighbourhood. The owner who managed the B&B were very friendly and gave us useful information of what to see and what to do. We strongly recomend a stay there. Very nice 1 night stay in a newish B&B on the outskirts of Kenmare. Host was courteous and the breakfast was nice. We arrived later than planned and there was no issue with the booking. Host provided good recommendations for dinner and excursions and we were quite satisfied with our stay. I would defnitely recommend this B&B and would stay there again if we return to Kenmare in the future.